An unusual insect that few people get to see in Iowa is the "grass-carrier" wasp of the genus Isodontia. The name refers to the nesting habits of the female wasp. The wasps fill nest cavities with grass and occasionally other plant fibers till the nest resembles a loose pile of brown grass clippings stuffed into a protected opening. In nature the nests are located in hollow stalks or stems of plants, galleries in wood, abandoned bee galleries and in vertical clay banks or bluffs. However, most people who observe grass-carrier wasp nests find them in the sliding tracks of windows or in the space that is left between the screen or storm window and the house window frame. A nest is made when the female wasp gathers and carries grass or plant fibers to the chosen cavity and provisions it with tree crickets (Oecanthus sp.). The tree crickets are the 1-inch long, slender, light green dead insects found mixed into the grass-clipping nest. The wasp lays eggs on or near the tree crickets and the larvae feed on the paralyzed prey. 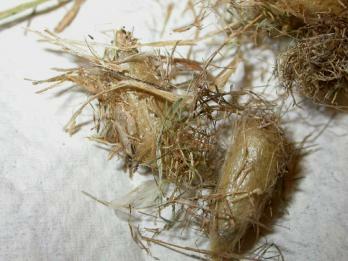 Full-grown larvae spin papery cocoons when mature. There is one generation per year and the overwintering stage is the prepupal larva within the cocoon. Grass-carrier wasps are solitary. That means each nest is the effort of an individual female. There are no workers to help with nest construction and larval rearing. As a rule solitary wasps do not aggressively defend their nests. They are capable of stinging but will do so only if harassed or handled. No special controls for grass-carrier wasps are necessary. 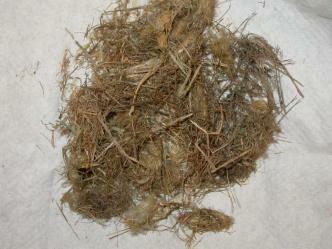 Discard the nests as they are discovered (usually when cleaning windows or changing screen windows). Chemical treatment is not necessary. Prevent future nesting in the area by installing tighter fitting windows and screens or by plugging gaps and openings leading to interior cavities. Do I need to remove my grass clippings to prevent thatch development?